This is a luxurious second floor condo, is a fabulous retreat for your next family getaway or corporate stay. Brand new to the rental market, the property is a gorgeous condo in immaculate condition. And you can’t beat the location. Located at Reunion Resort, it is nestled between 8 resort pools and 3 signature golf courses designed by the pros. Because the owners have a full membership your rental provides you access to all Reunion Resort has to offer from the three golf courses designed by golf legends Jack Nicklaus, Arnold Palmer, and Tom Watson, to the six-lighted tennis courts, to the five-acre waterpark with a two-story water slide, a children’s splash zone with water drenching buckets, and a lazy river! This resort is so full of world class amenities that you may find yourself ducking out of the crowded amusement parks a little early to enjoy all the activities Reunion has to offer. You may even decide to skip a day of long lines and amusement park food and make a day of it at the resort: catch some rays at one of Reunion’s pristine pools, including the kid’s favorite the waterpark; pamper yourself at the Reunion Resort Spa while the kids play at the arcade, at one of the playgrounds or tennis courts, or at the daily supervised activities for kids; enjoy a delicious meal prepared at one of four restaurants at Reunion Resort and dine on Italian delicacies, amazing steaks, a sushi bar, classic American entrees, or casual fare. Want to work off some of those decadent meals and desserts? This condo is within walking distance of the restaurants and pools. The property spans 3 tastefully decorated bedrooms. The bedrooms all have their own attached bathrooms offering privacy to all. This is a critical and great feature if you are sharing the condo with another couple or two or if you have a family that includes several children. The bathrooms have double vanities, granite countertops, and beautiful tile . The spacious floorplan separates the bedrooms in perfect fashion so everyone has their own peaceful quarters to retreat to at all times for a little rest and relaxation. All bedrooms feature comfy beds, high definition tv's, cable, reading lamps on the nightstands, and thick curtains for those mornings you want to sleep in without the bright Florida sun waking you up. There is also FREE Wi-Fi in all rooms, not just in common areas like at many resorts or hotels. The family room is a great room, which also includes a high definition tv, reading lamps, and a desk to check email, post pictures on Facebook, and surf the web. There is a full sized dining area for 6 and a gorgeous kitchen that boasts stainless steel appliances and granite countertops for preparing meals. On the other side of the family room, you can step outside to the long balcony, which faces conservation trees. The balcony is the perfect place to sip your morning coffee while you plan your itinerary for the day or to unwind and play cards or chat the starry night away in the gently evening breeze. Reunion Luxury Condo, a perfect place to call home while visiting Disney, Universal Studios, Sea World, Lego Land, or any place else in or near Orlando! **Access to the waterpark, golf or tennis have additional fees that will apply and advance notice is required and passes limited** It is absolutely critical to read your confirmation about these steps or you will arrive and not be happy! the resort charges entry fees of $18 per adult and $12 per child. A 7 day advanced notice is required and contrary to a previous review the owner of the unit cannot grant access same day. DO NOT book this condo if you want waterpark access and arrive within 5 days. Last minute arrivals WILL NOT have waterpark access. Condo was very nice,very limited cooking utensils, pots and pans. Reunion does not have a recycling program, disappointing. Condo was very clean and large. Mattresses were very comfortable. Didn’t use kitchen because trip was short but it is a nice size to cook in if needed. Bathrooms large. 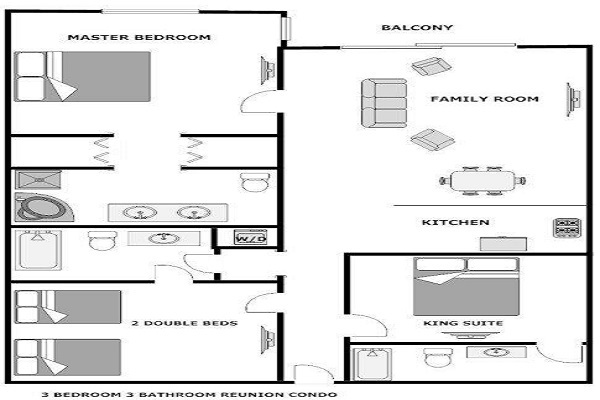 Condo would easily accommodate a large families. Location is really great wants you get your bearings on the area. Magic Kingdom is about 10-15 minute drive depending on traffic. So just as close as being on Disney property. October was a great time to stay. Unit we had was wonderful, no complaints except pillows need to be changed for new ones. We had a wonderful time in Orlando. My brother and I took 6 children to Disney and I couldnt have asked for a better place to stay. It was clean, well-maintained, and close to Disney. Tara was pleasant to work with. Originally we had a 8-bedroom rented through her but most of our family dropped out. Tara was able to provide us with this property without any problem or losing any money. She was a life-saver and we would most definitely rent from her again. We had an amazing time at the condo. It was clean and in a perfect location. The restaurants were perfect. We also spent some time at the water park. What a perfect place to spend a vacation. Great property, a little far away. Property was very nice, well cared for. The furniture could be updated and kitchen was very sparsely stocked. With traffic, property was a little far from Disney, Universal for my liking. Overall a great stay! We did have a few issues. New washer/dryer combo unit took 3 hours for a tiny load and then would not open, locking items in for 24 hours! Shockingly, they provide towels but no washcloths! Many other items that you wont find in your condo... dish soap, laundry soap, salt and pepper, paper towels, coffee filters. A map of the complex would have been very helpful in getting familiar with what all was offered. MANY great features to this resort but high fees attached to most! Tennis, bike rental, water park, etc. Resort was incredible, condo was beautiful and clean. We could have easily stayed here for a week and not left the complex! We were a little bummed to not to "right there" by Disney, depending on the time of day the drive was long only because of traffic. The place made up for that! It was BEAUTIFUL! It had everything we needed and we felt at home. We stayed with 4 little girls and there was plenty of room for them to run and play. We loved that we were right across from the park, and not too far from the pool. The place was well cleaned, and we didn't have a problem with anything broken. Thank you so much! We had a great time! It was everything it showed and said it would be! We loved the condo and having the one level was perfect for all of us. Everyone had their own bed and bathroom! Wished the furniture in the living/dinning area was a little more updated....but overall we were satisfied with everything this condo had to offer. The location was great, within walking distance to the pool and the waterpark. The place was also very quiet for the most part and everything was always neat and orderly on the premises. We even got the opportunity to view the fireworks from the 12th floor of the hotel that was located across the road from the condo property. This was perfect for our family (Mother - 79yrs, Daughter - 5yrs old, Relative -69yrs , and us 45-60yrs old. The owner having membership allowed us to get into the waterpark for free..although there are charges typically for utilizing the waterpark. Everyone was accommodating. The location is very close to I-4 and 10 mins drive from Champions Gate Resort, which I where i also attended an event. The price was very affordable for what we were getting versus staying in another hotel. I would definitely stay in this condo again. Most definitely! Our overall experience was very good. We had several minor problems but it was necessary for us to contact anyone during our stay. We would rate the accommodations with an A. Very good location. We booked this because it was a great price and seemed to get some good reviews. Then we read some bad reviews after we booked. Needless to say our stay was great (except for noisy neighbors at night, which isn't V2F's fault). The condo was clean, well-maintained, and easy to access. It was also close to Publix and some restaurants, as well as WDW. Had a small issue that was addressed the same day. I would highly recommend staying here. The resort is very well located, only 25 minutes from Seaworld or Aquatica for which we had tickets. It's very well maintained, all pools are heated except the last one for children and this is the only deception we have had. We didn't book the Water Park because we had full access to Aquatica during 2 weeks. The flat is great, very clean, everything was working well and all the family spent great holidays there. The vacation rental was in good condition and in a good location in relation to the waterparks and also in having a park for children to play on right outside the building. It had everything you need in order to be comfortable for a week. There was an issue with the dishwasher in that it kept coming off the track and didn't fit perfectly in the location due to a bump out with the stove. It was a very quiet location and I would recommend Reunion for those who want to be away from the hussle and bustle. There were a number of pools close to the site and within a short distance with a car was a waterpark for little kids that does not require passes/payment. I did not like needing to make reservations for golf 7 days out, as your plans may change on vacation or having to make plans to get passes for the waterpark 7 days out. We wanted to go on a certain day, but didn't decide until we were down there and they were not going to process it without a $50 upcharge which was ridiculous. There should be more flexibility on Reunion's part and they would get more business from guests if there was. The golf courses were wonderful and challenging and visually very beautiful. I really enjoyed the courses and that the traffic on the courses was not heavy at all. My family and I had a wonderful stay at Reunion Oasis. the vacation home was spotless and very well maintained. The property description was very accurate. We had trouble finding the unit but the directions from the gate helped. The only complaint is the telephone in the unit was not working even after the repairman came to fix it. After each use it had to be reset. Overall it was a great place to stay. I Would highly recommend this home and I look forward to coming back again. The Booking agent was very professional and helpful.